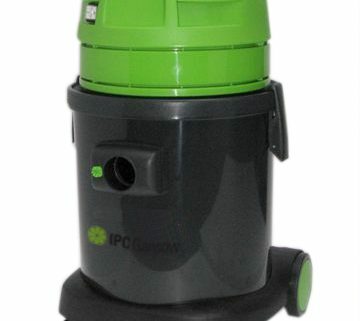 The IPC YS 2/45 is a powerful twin motor wet & dry vacuum with a 45L stainless steel waste container. Featuring 2 independent by-pass motors producing an airflow of 140 L/s, heavy duty castor wheels and the IPC anti-foam system for wet use. With the IPC Sanifilter to prevent bacteria growth on the dust filter and anti-tear hose the YS 2/45 is a true commercial vacuum. The IPC Soteco GV26WP is the ideal Wet & Dry vacuum for collecting all types of debris. With a wet filter inbuilt in the vacuum head and a dry filter for normal cleaning. Featuring a 26L capacity waste bin and powerful 1300w vacuum motor, the GV26WP has an airflow of 55.5L/sec. Comes with complete tool kit including 40mm hose for larger waste. Also included is an Aluminium/Plastic Adaptor, Flat Lance, Round Brush, Complete Flex Hose x 2.5mtr, Plastic Wand Conical Cuff, Curved Dust Tool, Curved Wet Tool and an aluminium/Plastic Tube x 0.5mtr. The GV17WP wet & dry vacuum features a powerful 1300w vacuum motor with both wet float valve and dry filter. With a large 17L waste capacity the GV17WP is perfect for collecting all liquids and is ideal as a small emergency spill vacuum. The 17L tub features integrated tool storage for the included accessories such as the crevice tool and round dusting brush. The GV17WP also comes with two floor tools, one for wet collection and one for dry debris. 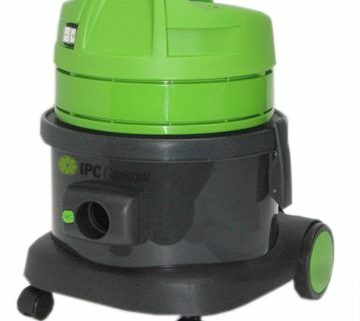 Featuring three 1000w motors and a 78L container the IPC GS 3/78 W&D is ideal for commercial use. Each motor is controlled individually depending on the power required and the 78L stainless steel container is mounted on a tipping chassis for easy emptying. Complete with a 38mm wet & dry tool kit and the IPC anti-bacterial Sanifilter.